AMC Sub Inspector and Technical Supervisor Syllabus 2018. AMC Notification is out. AMC is recruiting for 199 Sub Inspector and Technical Supervisor Govt Job Posts. 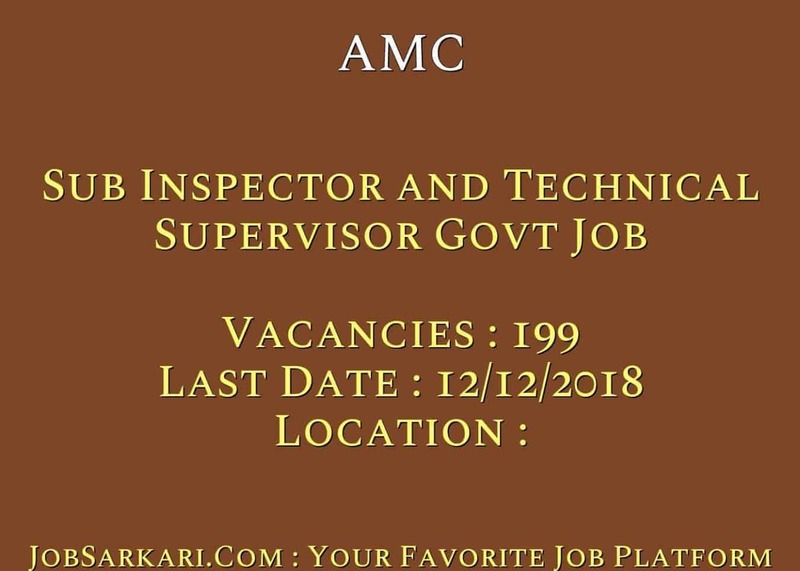 You can check AMC - Ahmedabad Municipal Corporation last date, download AMC notification, visit AMC official website and check other AMC Vacancy details.Complete Vacancy and recruitment Details about 199 Sub Inspector and Technical Supervisor Govt Job vacancies in AMC are provided below by JobSarkari.Com only for you. Last Date for Apply Online 12/12/018 till 05:30 PM. Sahayak Sub Inspector Candidate Must Have Passed Diploma in Civil Engineering. 111. Sahayak Technical Supervisor Candidate Must Have Passed Bachelor Degree in Civil Engineering or Diploma in Civil Engineering. 88. Total No of Post 199. Sahayak Sub Inspector Max 35 Years. Sahayak Technical Supervisor Max 30 Years. 4.Upload the Scanned Copy of Documents in the Prescribed Size and Format. 6.Online Application Can be Submitted on or Before 12th December 2018. Q. What is the Last Date For AMC Sub Inspector and Technical Supervisor Govt Job Vacancy ? A. 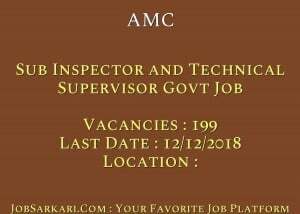 Last Date for AMC Sub Inspector and Technical Supervisor Govt Job Posts is 12/12/2018 . Q. What is the Form Type of AMC Sub Inspector and Technical Supervisor Govt Job Recruitment ? A. The Form Type for AMC Sub Inspector and Technical Supervisor Govt Job Posts is Online. Q. How many vacancies are available in Ahmedabad Municipal Corporation Sub Inspector and Technical Supervisor Govt Job Posts ? A. There are about 199 Vacancies in Ahmedabad Municipal Corporation Sub Inspector and Technical Supervisor Govt Job Posts. Q. What is the Full Form of AMC ? A. Full Form of AMC is Ahmedabad Municipal Corporation .